Honor's H9 smartphone features audio tuned by a Grammy-winner | What Hi-Fi? Honor has announced a brand-new flagship smartphone, the H9. Available to order today for £380, and on contract starting early next month, the H9 is available in three colours: Glacier (grey), Sapphire (blue) or Midnight (black). It's running Android 7.0, packs 4GB of RAM and 64GB of ROM (and has a microSD card slot to boost that by up to 256GB). The screen is 5.15in across and has a 1920 x 1080 full HD resolution. Bluetooth is of the 4.2 variety, there's a 3200 mAh battery on board (with fast-charging technology via USB-C) and, praise be, there's a 3.5mm headphone socket in the 7.5mm thick frame. The main camera is a 12 MP dual-lens affair, while the front-facer is 8 MP. Audio file compatibility runs from MP3 to FLAC. 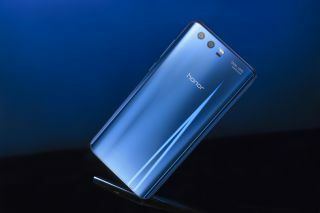 Honor has paid special attention to audio quality, retaining Grammy-winner Rainer Maillard to fine-tune the H9's sound and teaming with Monster on something called the Honor Purity equaliser. The body of the phone is made from glass and metal, with a subtly curved rear panel and fingerprint security.